Charles was the son of Samuel and Lizzie (Kinnaird) Slack which made him a first cousin to my Grandpa Kinnaird and grandson of our mutual ancestor, William George Kinnaird. 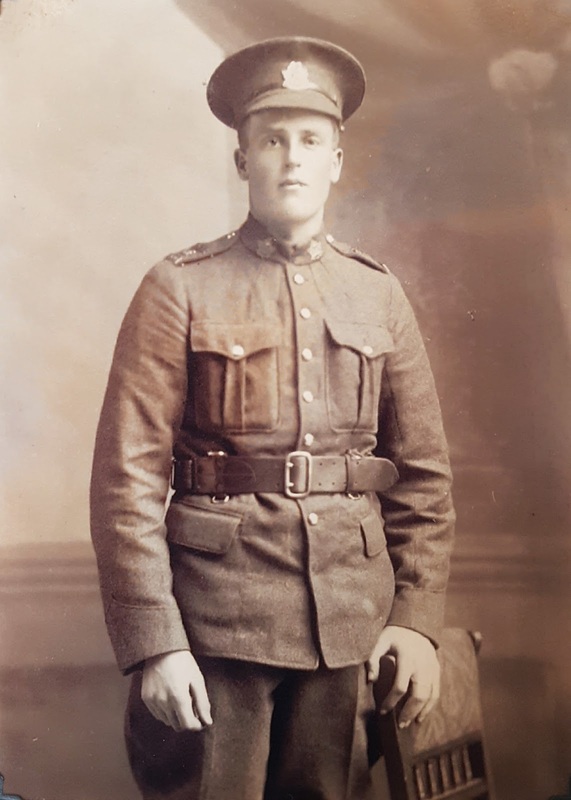 I have been patiently waiting for awhile now for his service file from WW1 to be digitized and released by Library and Archives Canada. Many of my ancestral connections have surnames starting with "B" and "C" and since they were being scanned and released in alphabetical order, it was finally the time for "S". You can read all 60 pages of his service file here. Charlie is the man with the X on his knee in the photo below. Charles Ernest Slack was born on November 26, 1895 at his parents' homestead near Bede, Manitoba. At that time it was known as "Ruth" until 1925 when the C.P.R. changed the name of the siding to Bede. He had two older brothers and eventually three younger sisters. 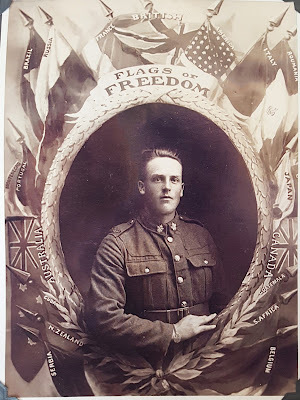 Twenty year old Charles enlisted in WW1 on February 5, 1916 at Melita, MB and was given registration number # 292153. He was described to be Presbyterian with fair complexion, blue eyes and light brown hair and stood 5 feet 7 and a half inches tall. After training at Camp Hughes, in November of 1916, Charlie and the 46th Battalion sailed from Halifax on a ship named the Olympic. Thank you to his grandson Rod for sharing the next two pictures with me. I am struck by his youth in these and can only imagine the horrors he experienced during his time on the front. As is the case in most of the service files I've read, it contains the soldier's will leaving all his possessions to his mother Lizzie. One of the witnesses on the document from January 30, 1917 was John Owen Kilkenny (#292140) from Broomhill, a neighbour who signed up in Melita a week after him. 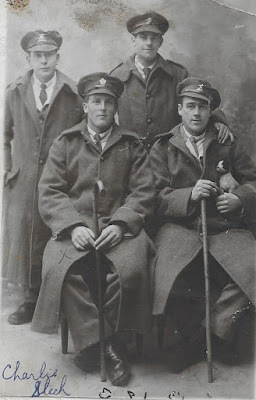 A cousin of this John, another John Kilkenny (#292196) enlisted in Melita the next week and no doubt the three young men stuck together as much as they could and I wonder if these chums were also in the photo above. According to the R. M. of Albert history book, John Owen was known as "Ginger Jock" and his cousin was just "Jock". Their fathers were brothers and built the general store that still stands in Broomhill today. Tragically, both Kilkennys were killed in action, John in November 1, 1917 at Passchendaele and John Owen on September 27, 1918 at Canal du Nord. His file says Charles was awarded the Good Conduct Badge on May 4, 1917. Records show that $15 was sent back to his mother Lizzie each month he was overseas as was customary. He was wounded twice, first on May 4, 1917 by a gunshot wound to his left foot and shoulder and then a shrapnel wound to his left on leg September 27, 1918, the same day his buddy J.O. Kilkenny died. He spent a short time in hospital but was returned to the front in a few weeks both times. On March 15, 1919 Private Slack landed back in Canada. Those three years would have changed him from a boy to a man and seeing the families of buddies who didn't return would have been so difficult. 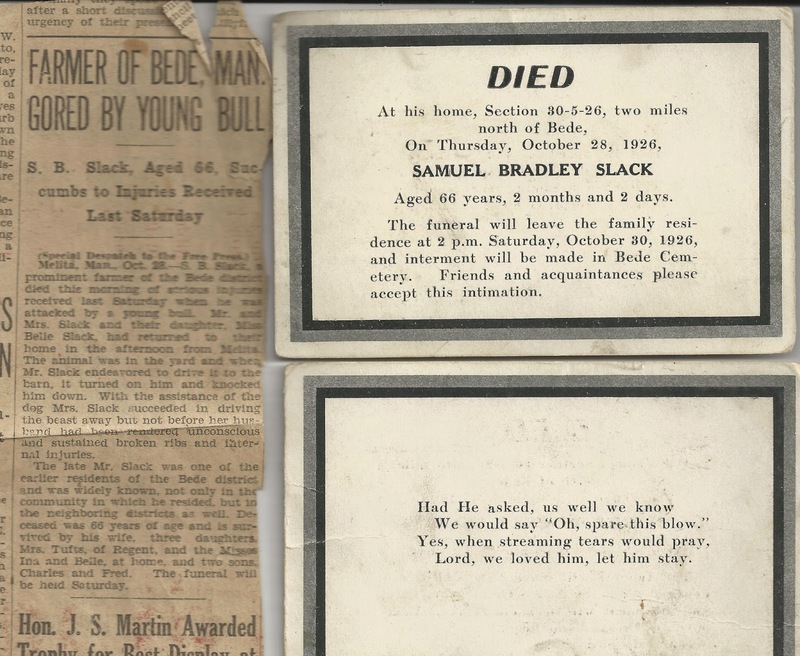 Tragedy continued with the death of Charles' father suddenly in 1926 in an accident as is detailed in the clipping found in my Grandfather's possessions. Charlie married Mary Fenske in 1930 and they went on to have 3 children and continue farming the original homestead. Charlie died in 1959. I feel privileged to tell his story and welcome any further information in the comments below.